BEVERLY HILLS, California (May 16, 2017) — During the years of the Vietnam War, the Nguyen royal family set out to protect its treasures by literally burying many of them underground around the country. Once Saigon fell and the family migrated to the United States, they spent decades recovering the pieces. Now, 116 historic pieces are finally being sold in an online auction, with GWS Auctions Inc. of Beverly Hills conducting the sale. The auction includes a Nguyen imperial large blue and white porcelain palace vase with the names of the emperors from the Qing Dynasty. “Every piece in this collection has a story, and many of these are no doubt destined for various museums around the world,” said GWS owner Brigitte Kruse. 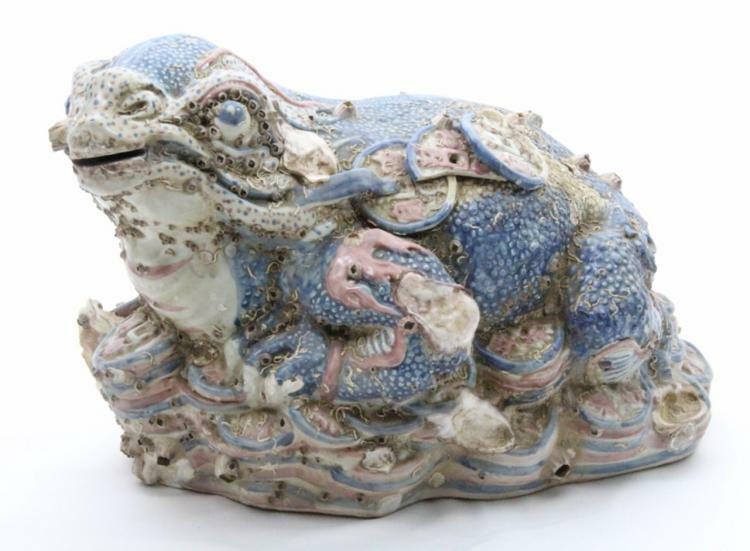 “Another really remarkable find is a coralized three-legged Jin Chan (money toad) recovered from a shipwreck,” she said. Kruse, whose firm also consulted on the auction of a similar collection in 2016 of the Royal Hoang family, said she anticipates strong interest among wealthy Vietnamese American families who desire to return some of the pieces to their homeland. “We have about 50 blue and white porcelain pieces, as well as a great deal of jewelry that was made for the royal family. Many of these are Ming Dynasty and Qing Dynasty pieces. There’s an enormous interest right now in Vietnamese antiques and jewelry, and pre-bidding on these got off to a fast start,” she said. The auction will begin at 5 p.m. PST Saturday, May 20 at gwsauctions.com.